The box was custom-made by Glenn Bartlett, a specialist craft binder based at Culham. Once the structure was sound and clean, the silverwork could be put back. 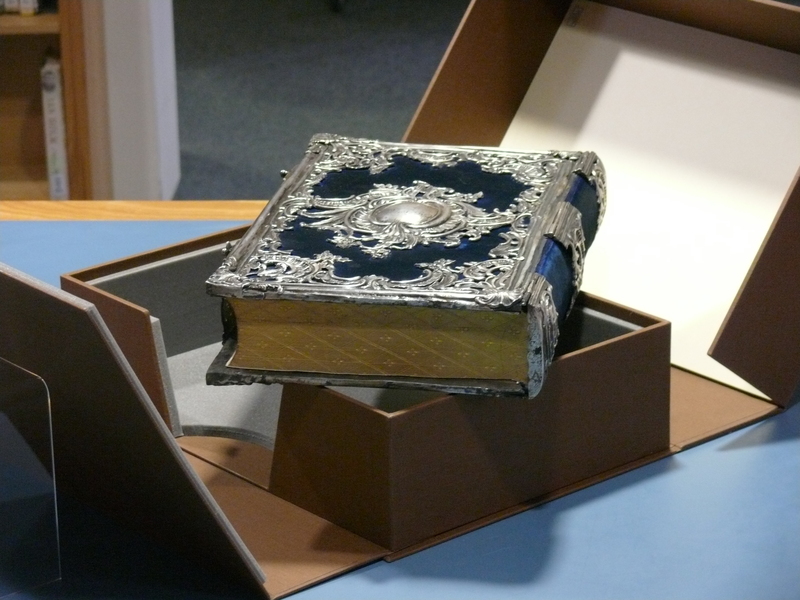 The final act of conservation was to build a hand made box, tailor-made to fit the book. This is lined with an inert foam so that the weight of the whole book does not rest on the parts of the silver which jut out on the lower board. The box also has cut-outs in the padding so that the book can be lifted out of its box easily, again reducing wear and tear and ensuring that it is always handled correctly. The box is extremely strong. Encasing the book in its box ensures that it cannot be crushed; it is kept away from natural light so the silver will not tarnish; and the velvet is kept free from dust and grime.